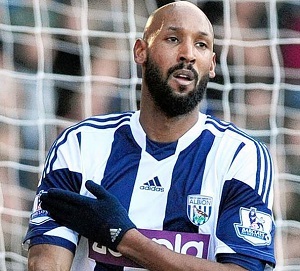 Anelka was fined and suspended for his “quenelle” in a 2013 match. While there is a lot of truth to the modern adage that “sports is the great equalizer” when it comes to social and cross-cultural understanding, our playing fields have also been witness to some particularly ugly incidents of racism, sexism and religious intolerance. The shining black eye of international soccer at the moment is racism by fans being directed at players and other fans. Some of the world’s top Black soccer stars have been subject to racist chants and gestures from hostile crowds — throwing banana peels on the pitch while making monkey noises, for example — while some Black fans have also been harassed. Earlier this year, for example, a Black man in Paris was shoved off a metro train by White soccer fans, who then directed racist chants at him. Soccer’s top governing bodies and organizations deserve their share of credit for taking steps and trying to eliminate such racism from the game. However, not as much attention has been paid to another layer of intolerance in the sport: that of antisemitism and Islamophobia. In grassroots football, the impacts are severe and wide-ranging. I know of [Jewish] parents who have either withdrawn their children from local games or who simply see antisemitism as part and parcel of the pitchside experience when watching their children. I know the same can be said for parents of young Muslim children too. Racism either on or off the field in these surroundings is wrong, discourages diversity in the game and in our local communities, and is simply an anathema to all the positive disciplines and experiences that football should provide. Outright racism, although it still exists, has become less acceptable in mainstream football and initiatives to broaden black, Asian and minority ethnic involvement in the game at all levels are ongoing. Antisemitism and Islamphobia, however, have not enjoyed the same degree of attention. Anelka, who is of French nationality and converted to Islam in 2004, was fined £80,000 (about $124,000 in the U.S.) and suspended, essentially ending his career in the world’s most popular and profitable soccer league. At 36 years old, he is now at the tail-end of his career as a player-coach for Mumbai City FC in the Indian Super League. It would be an understatement to say that Muslims and Jews have clashed historically, a long-standing divide that is responsible for deadly warfare and terrorism in some parts of the world, and more mild but still deep-rooted social tensions and segregation in other parts of the world. Anybody from any background should be able to play the game. It crosses every racial and religious divide, and so there must be higher standards in tackling racism. The key question is: do you feel comfortable taking someone identifiably Muslim or Jewish to a game? If answer is no, there is still a problem.